Please contact me regarding the 2018 Ford TRANSIT - Stock# 18P556 Transit SvcBo for sale at TruckerToTrucker.com. Take a look at this 2018 Ford TRANSIT. It is Stock# 18P556 Transit SvcBo at TruckerToTrucker.com. 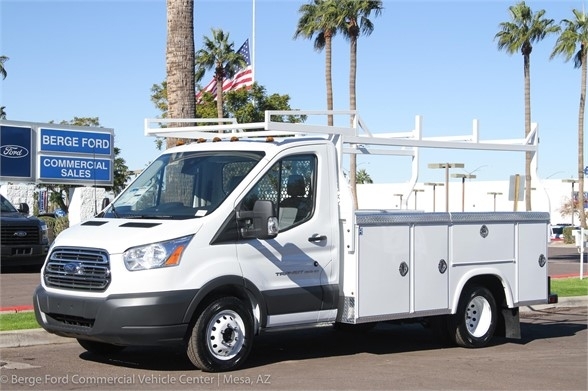 For sale is this new 2018 Ford T350 Transit HD utility van work truck. This dually T-350 is equipped with a 11' Royal service body mechanics bed. Powder coated ladder rack, fork lift loadable. 40-VDO-125-TRS Reverse backup camera. power driver seat, Rear wheel drive, 138" wheelbase, long power mirrors and keyless entry. 3.7 liter V6 gas engine and 6 speed SelectShift AT Automatic. 275 hp. A/C, power group, cruise, tilt, daytime running lights and heated trailer mirrors 10360 # GVWR and leather captains chairs. No Spare tire. Hitch optional. SYNC system for hands free phone use and CD. 50 states emissions. California Compliant. Ford has been making the Transit van in Europe since 1965, perfecting the product and configurations. With competition like Sprinter, Mercedes and others, Ford has designed an outstanding product to replace the venerable E-Series You must test drive the Transit before you buy any other van on the market. Larry H. Miller Ford Mesa Fleet Featuring Ford Commercial Credit and ESP extended service and maintenance plans. Additional rebates may apply. All standard Ford Commercial rebates applied to National Advertised prices. Ford Credit financing is required on most new vehicles. Rebates can vary by region. We use Arizona rebates to set our National Ad prices. Sale price good for vehicles registered in the U.S. only. Sale price is good for companies or business owners. Call Dan Emmons, Larry H. Miller Ford Mesa Fleet (888)519-4707 or Cell (602)300-0107.